Imagine Kastelplein early in Batavia, 1619. Castle Square (Batavia) - Kasteelplein - located right in front of the castle. On the left side and right side of this castle also extend spice warehouses. All this is part of the castle, including the walls of the City of Batavia. Not far from a castle, built the Gate of Amsterdam. 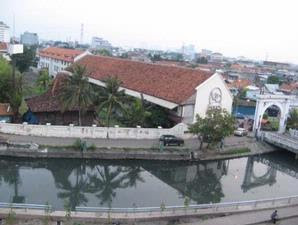 Not far from the gate, flowing Kalibesar (Grote Rivier), which is the lifeblood of Batavia at the time. The wooden bridge built to connect the east and west sides Kalibesar. VOC is where power begins. The castle which lies east of River estuary was built by Jan Pieterszoon (JP) Coen, Governor General of East India Company, after the first burn on the 1619 White Rose City. Not far from the castle, the port of Sunda Kelapa, Fort Culemborg, then the Tower of the Scouts' Uitkijk "- Tower Syahbandar, and the Lighthouse of Sunda Kelapa in Muara Baru, stood guard Batavia. Difficult, indeed, to imagine the castle and its hall are gone. Documentation is just a painting. As ever written by Warta Kota, the former location of the castle is in the territory now called Jalan Ear (to the north). Across from a former spice warehouse ("Ostzydsche Pakhuizen") in which there is a remaining wall of the east side of Batavia. If the former spice warehouse at the time of the VOC and the side wall on the right, then the former castle land there on the left side. While there are now around in your kasteelplein Ear Road itself. Now the condition of the former castle into a truck and become a slum. On land owned by Ditpalad they grew new buildings both official and unofficial. There was no sign that there once stood the Castle of Batavia. Meanwhile, place to stay, a former warehouse building was none other spices VOC Maritime Museum. Maritime Museum is only one of many former warehouse store spices in the VOC. The building was built 17 centuries. There were tragic circumstances wooden barn, just behind the Maritime Museum. Warehouses in Pakin Roads whose age was younger than the Maritime Museum because it was built after the Maritime Museum - which enter in Westzijdsche Pakhuizen or warehouse on the west bank. Nine conditions behind the woodshed Maritime Museum all under water since 1995. Water into the main sights and ex-warehouse building located in the middle. No one can trace the access to these buildings. There are only wooden planks former warehouses that used to pursue the road to the former warehouse building. Of the nine former warehouses, only one made of stone. The rest of the wood. One warehouse, on the outer side, was torn down two years ago because it was very dilapidated condition. A warehouse filled with residents. The rest is empty. Mossy. Warehouse wall that is almost contemporary with the barn that is now the Maritime Museum, the roof had collapsed. The warehouses were located just behind the museum. Among the dilapidated warehouses that are now owned by the Company of Trade of Indonesia (PPI) also there is a remaining wall of the west side of Batavia. The warehouses at the back of the museum were built 1663-1669 by Jacques de Bollan. In places where Mitra Bahari Apartments now stand, was once the shipyard. This shipyard is still entered in the west bank of the warehouse complex. Shipyards which are still intact and switch functions into a restaurant around at Kakap Road, Cafes and RM Kuring Shipyard. 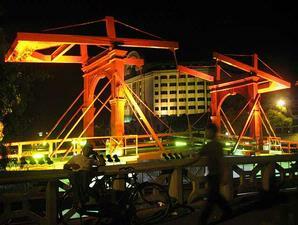 Intan Bridge City should look beautiful at night, especially after the restored three years ago. Historical records mention, a wooden bridge which was originally named Engelse Brug (bridge near the castle England because England) and later renamed the Hittites Middelpunt Brug (Central Bridge) at the time of the VOC, then changed to Ophaalsburg Juliana (Juliana Bridge), was built in 1628 . First 42 years of Magere Brug (Bridge Magere). Bridge to Bridge City in exactly the diamond was in between two canals, Prinsengracht and Keizersgracht, and connect and Nieuwe Kerkstraat Kerkstraat Amsterdam. Speaking of Old Batavia environment, the Community Historia Indonesia (KHI) will hold the event "Jakarta Midnight Trail: Staying in VOC Former Spice House." The event was held 27-28 March. "We have invited participants around the warehouse side of the road to the east, Port of Sunda Kelapa, City Diamonds Bridge, Asmterdam Gate, and Bahari Museum. We stopped and stayed at the Maritime Museum is a repository of the west side, "said Asep Kambali Chairman of KHI. Maritime Museum of none other than the former part of the "Westzijdsche Pakhuizen" or the Spice Warehouse in Edge / West Cliff where there is also attached to the wall of the west side of the city of Batavia. "We will also hold a discussion, and a movie Max Havelaar," he added. For this event are charged USD 80.000/orang participants and prospective participants may contact Alun at 021-978.90498 or register directly via SMS to the number 0813.8104.6352. There is nothing special on the show this time because the anniversary was held in order to KHI-7. "Anniversary of his March 22 yesterday, but we make this event as well as shower in March 27 that," Asep said again, "We will continue trying to make history interesting to enjoy. Do not make people frown when they hear the word history. I believe no matter how small our efforts, for the past seven years there must be the effect. Most baseball, people become more like the Old City, getting to know about the history of Jakarta. "